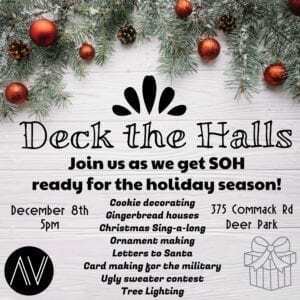 Come join the SOH sam as we deck our halls for the holiday season. Amidst all the decorating, we will be decorating cookies, making gingerbread houses, writing letters to Santa, singing Christmas carols, making ornaments and writing letters to the military! We will also be having an ugly sweater contest to find or make the ugliest Christmas sweater you can find and wear it to the party! We are looking forward to an awesome time celebrating this wonderful season together!